My husband bought me a Kindle Fire for our anniversary. When he brought back a "cover" for it I noticed that there was no hole for the lens to show through. Hmm, you mean I have to take it out of this thing every time I want to take a picture? If I'm going to do that I'll make one that I like! He agreed and it went back to the store. So this is what I came up with. Funny that I used vintage feedsacks for a 21st century gadget! 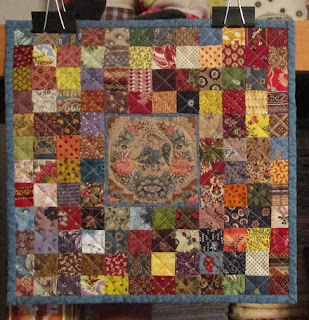 I simply machine pieced (quilt as you go) the strips to a long piece of double cotton batting and a backing and then brought the back to the front and stitched it down. I used Velcro for the closure. Works great! Even for the technically challenged (that would be me) it the Kindle seems pretty simple to run. 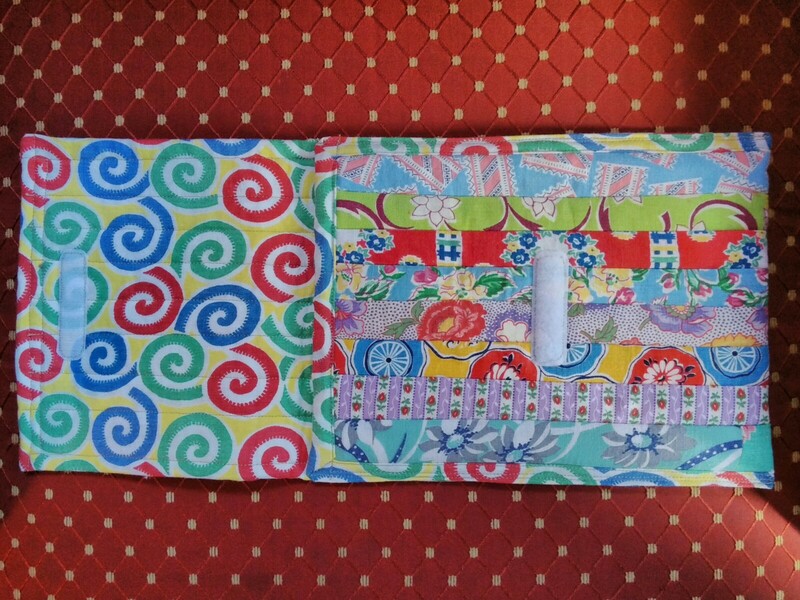 Now I can take this to quilt shows and not have to "borrow" his iPad. Aha! 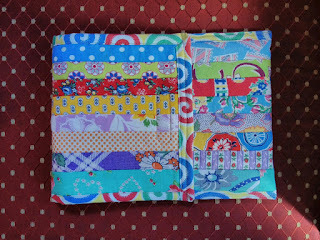 I've started hand quilting my latest potholder quilt. 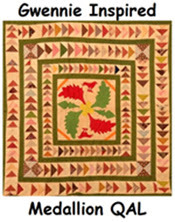 I will be demonstrating hand quilting and needle turn applique at our state show, Maine Quilts 2015 in Augusta, Maine this weekend. Hope you get a chance to visit the show and enjoy some Maine vacation time! I know we are lucky in Maine so I can't complain (too much) about the heat, but my fingers are sticking to my needles! The only thing I could muster in the heat we had yesterday was my Time Warp stars. Week 25 was "wood block prints" I used some very old (mid 1980's) Hoffman block prints. Not really reproductions, but I love them! Week 26 was "pillar prints" - hard to do with a 6" block! Week 27 was "quercitron and aborescent prints" I did all right with the color but not too well with the tree part! Lest you think I have been idle so far this summer... 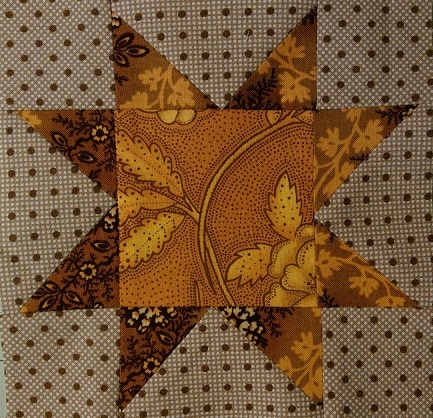 I have made good progress on my latest potholder method quilt, "Burning Leaves". I try to give all my potholder method quilts a title that incorporates cooking or at least burning (since that is the way I cook!). 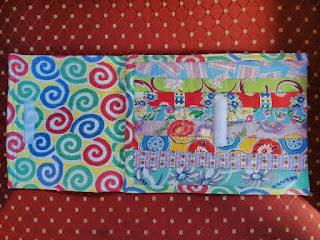 I keep a daily journal of my quilting endeavors on my sewing table. I jot down whatever I am working on the day. 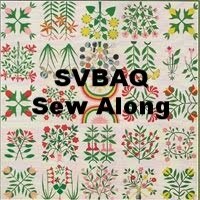 I used to record how much time I actually spent on each task (as that seems to be a burning question with so many non quilters) but now I just record the start and finish of a quilt so that when people ask me (that number one question), "how long did it take to make", I can tell them exactly. 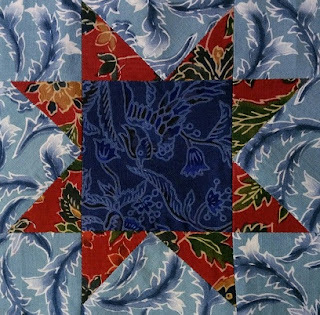 Actually I do it for myself as I like to look back over the years and get a kick out of what I wrote about a particular quilt. I have been doing this since 1978! I have used the AQS engagement calendars since it came out (1986 I think). 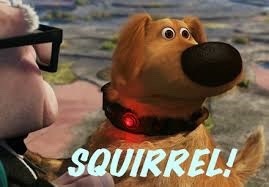 Anyway.... I still work full time, so my summer routine is to get up and work for an hour or so before work (I am a morning person) and then in the evenings when it's not too hot. (I get a lot more done in the winter!) 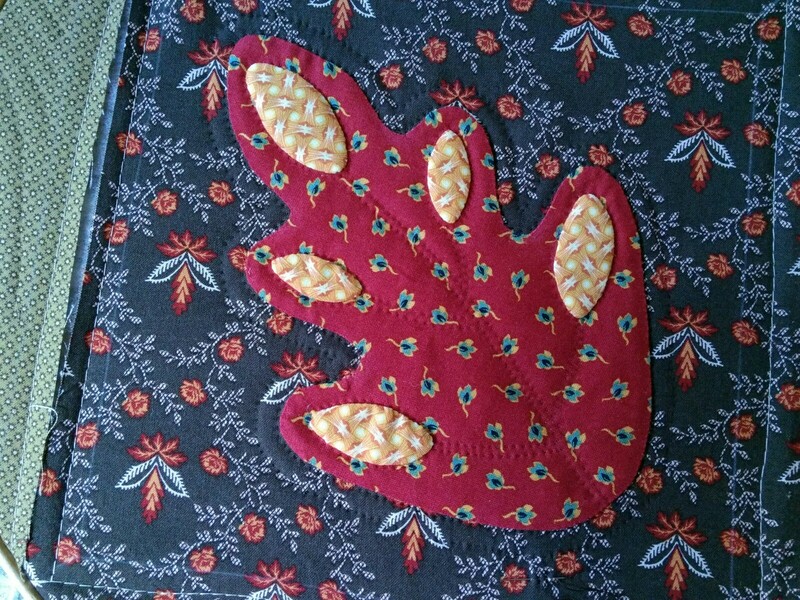 For the last few weeks I have been hand appliquing the leaves and ovals on the leaves for this quilt. I have two baby quilts and a wedding quilt to make too, but for now I am enjoying the hand applique. 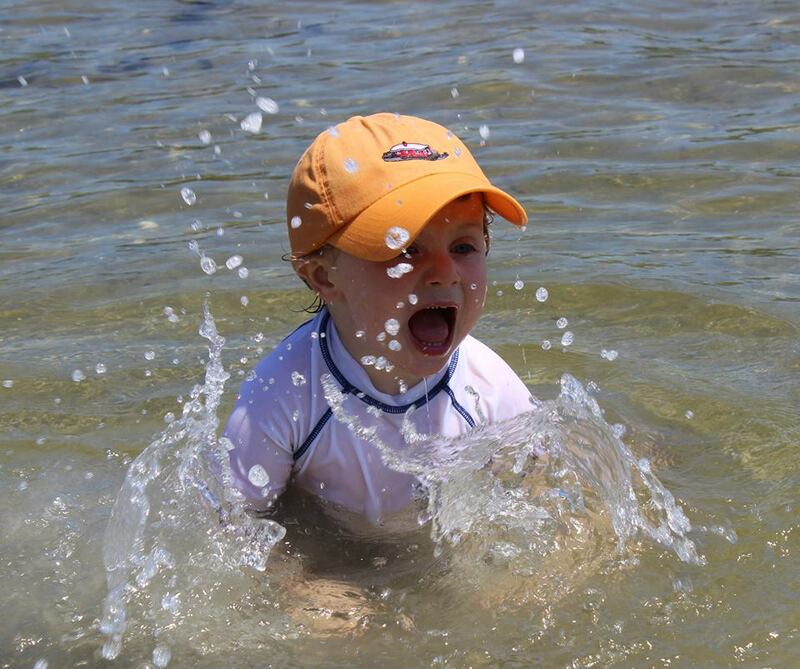 Summer is my least favorite season, but for some people in my family.... well, I guess this says it all! But, I'm over it now! I have entered my rendition of the Jane Stickle quilt, “Quilting with Jane” in our state show (Maine Quilts 2015) at the end of the month. So, being as how I made this in the potholder method, I thought I’d better make sure it hangs properly before I send it off. Hmmm… as you can see I have a bit of a problem with the cone shaped border pieces. If I had thought to do one border first I would have figured out that all I had to do was shave 1/16th off each cone and it would have been fine. I even contemplated re-doing all of them, but I quickly changed my mind. First of all, I enjoyed making it. It was a fun challenge so if I never show it again, so be it. See the wavy border - Argh! But more importantly, I discovered after hanging it in the dining room, that my grandson LOVES it! He is 4 ½ and with his autism, verbal communication is very difficult for him. He stays over at Nana and Grandpa’s every Wednesday night and when he passed by it, he did an instant double take. 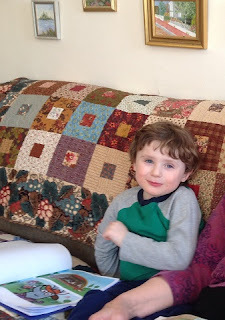 His eyes and big smile said it all and he pointed out every shape from circle to pentagon (he loves his shapes!). So, conclusion – I am hanging it in his room and he can count the shapes as he falls asleep. What a great solution! Thanks Nana - I love it! If at first you don't succeed - improve it! After posting that I might make up a few kits of this little medallion, Louise jumped right in and bought one. She e-mailed me the photo and a funny (although not to her at the time, I'm sure) story about how she couldn't figure out why the center block was so small until she realized her "quarter inch" foot was really 1 1/8"! 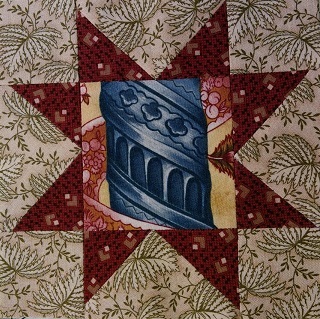 So, as any great quilter would do, she "improvised" (aka improved) it by adding a little border around it. I love it! Hope everyone had a Happy 4th and that you will find a little quilting time today!